I've been in Tacoma for a few days, and even caught a structure fire with my sister, getting to help her out with the canteen unit. It was a very strange feeling for me, being right there after it was over, watching the guys drain and roll hose. You're not supposed to stand around when there's work to be done, and I repeatedly found myself absently going for a line to break couplings, drain, roll, collect SCBAs to clean up and refill, all that. No, not my agency, not dressed for it, but dang I sure felt bad standing around, kept waiting for someone to gripe about what the heck Frank is doing not helping, who does he think he is being lazy? Weird. 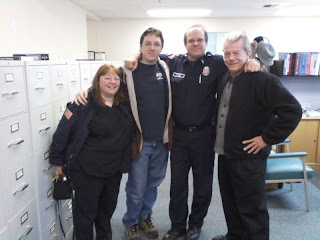 Anyway, today sister and I met this morning to try to catch Joe Stiles, who now works in Fire Prevention - whose offices are fittingly at the building which used to be the fire station where Engine 17 started out with Tacoma. Luckily, Joe was there. I didn't tell him this when I was there, but I think I had about as much trouble recognizing him that he did with me. He figured out who I was because sister was right there, but he does not look nearly as old as I assumed he would. Joe said he was fixing to read this blog not even 15 minutes before we showed up unannounced, so he's undoubtedly going to read this: Dude, you have not aged a day... on the outside, anyway! It was great to have a chance to meet them again after all this time, and apologize for being the goofball I was and all the trouble I caused. They were graceful and downplayed it, but I know there is more than one way to define "enthusiastic". 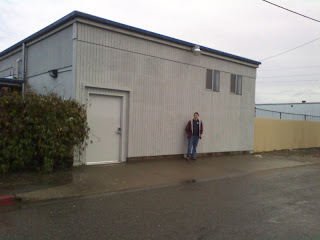 Sister also grabbed a shot of me standing where Engine 17 first responded from in 1970. But since this is office space now, only the apron ramp in front gives a clue that this used to be Station 17.
that this used to be where E17 rolled out. 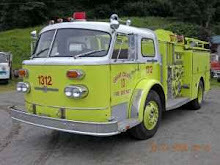 So, those of you on TFD now or ever before, as you guys are being dragged in here with my apologies for the rambling tripe that passes for a blog when I'm not working on Engine 17.... this one's for you, too: Sorry, and thanks for keeping me alive despite my best efforts to get dead early. I've spent the last seventeen years since I got the badge, trying to make up for it. Maybe one day I'll feel the debt has been repaid. If not, tell me when you're working, and I'll arrange to drop by with apple pie and ice cream for your crew. And one more friendly shout out on behalf of the crew at 6's: Tacoma, stop teasing and give them their new engine, already! Bro, it was awesome having you in town and having you come out to play with the Fire Buff Battalion at the stucture fire. I wish I had been ready to snap a picture of the two of you when you and Joe began to recognize each other! It was priceless! For any firefighters who read this and remember my brother and or me from the 1980's, I want to say thanks for being so kind to us and treating us with such warmth when we must have been annoying as all get out. You really made a difference in our lives and I am grateful for it.